Georgia is a country in Eastern Europe with the Black Sea to the west and Armenia and Turkey in the south. It is situated at the crossroads of Western Asia and Eastern Europe, historically making it a hub for trade. Unless traveling from a visa exempt country, visitors must obtain a visa from the Georgian Diplomatic Missions beforehand. All visitors must have a valid passport. Georgia allows free import of 400 individual cigarettes, 4 liters of any alcohol, personal and non-commercial goods up to a weight limit of 100 kilograms. Personal items including jewelry, cameras, computers, etc. must be declared upon your entry to Georgia. This beautiful country offers so much to visitors. Amazing mountains, breathtaking rivers, magnificent valleys and so much more. I've enjoyed hiking, trekking and exploring much of Georgia's beauty. I highly recommend visiting Tusheti National Park for the awesome Caucasian mountains. Besides the impressive nature, the cities are definitely recommended as well. Tbilisi, Batumi, and Borjomi are full of beautiful architecture and fun to explore. To save money while I was in Georgia, I decided to rely on the kindness of the locals and couch surf. I got to meet Mikey, one of my hosts. We quickly bonded over beer and singing and are still friends to this day! He took me to a local place called MacLauren's Irish Pub and it was an experience. The pub was cozy, and the atmosphere friendly, everyone was in a good mood. We quickly made friends with the other patrons there, bonding over beer and delicious food. Drinking has always made me want to sing more, so after a few pints, I just had to start singing. Mikey joined in and we started singing songs from the Beatles. Other patrons eventually joined in, then the rest of the pub. We sang songs from the Beatles, the Georgian national anthem, and some Georgian folklore songs. It was great fun and I got to meet so many new people. This was definitely the highlight of my trip, besides all the beautiful sights of course. It was my first time to Georgia. 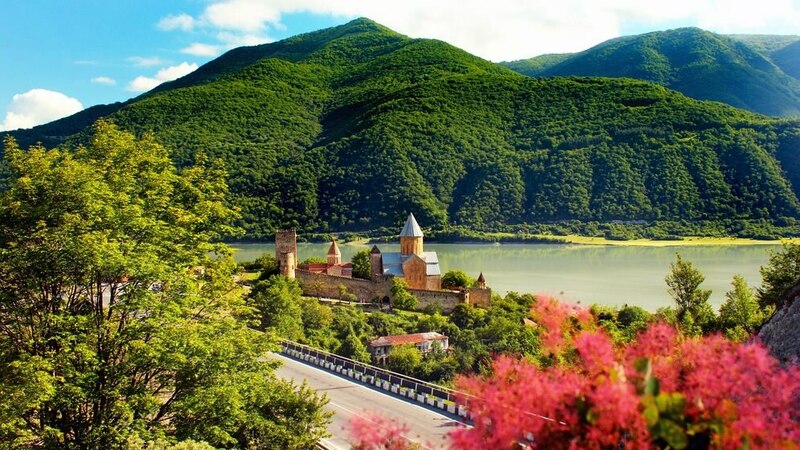 I booked my ticket to Tbilisi, and it was really a charming place to visit. The beer was tasty, the food was cheap (and tasty), and the sights were breathtaking. I loved it so much that every holiday I get, I have to go to Georgia. For anyone that has not been yet, you simply must go! Q. When is the best season to visit Georgia? A. Visitors in the spring will be able to enjoy temperate weather conditions. However, there is frequent rainfall during the spring in Georgia, so you will need to pack rain gear. During the summer, temperatures will range from 23 to 30 degree in Celsius, and humidity is high in the coastal areas. Georgia in the summer is full of tourists as it is a popular season to visit. During the winter, temperatures will range from 2 to 6 degrees in Celsius. Snow is common in Georgia and visitors can enjoy winter sports such as skiing. Q. Is it okay to consume alcohol in public areas in Georgia? A. No, pubs and bars are the only places for consuming alcohol. Breaking this law will result in a fine of 150 GEL. The main international airport in Georgia is the Tbilisi International Airport. Georgian Airways is the country’s national airline. You can book direct flights to Georgia's Tbilisi International Airport from Turkish Airlines, Qatar Airways, Lufthansa Flights, Gulf Air Flights, and more.